According to a report released by the Trust for America's Health (TFAH) and the Robert Wood Johnson Foundation (RWJF), the percentage of obese or overweight children is at or above 30 percent in 30 states. Additionally, obesity costs U.S. citizens an estimated $100 billion a year. A healthy diet for teens is essential not only for overall health, but also to keep stress under control, increase energy and maintain mental processing and health. People may notice that their mood feels more intense at certain times of the day, especially before meals. The foods you eat affect mood, mental functioning, energy and stress levels. Eat Your Meat! 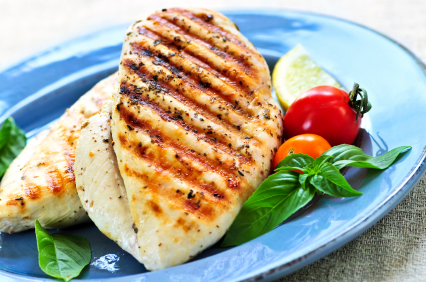 - Protein from lean meats such as turkey and chicken are a good source of amino acids, which produce healthy serotonin levels and aid in memory function. Keep Carbs Simple - Whole grains such as wheat bread, oatmeal and brown rice are rich in vitamin B and folate, a mineral known to increase attention span. Stay Hydrated - By drinking fluids throughout the day, teens are less likely to lose energy and maintain healthy skin and joints. Fat Can be Your Friend! - Omega 3 and Omega 9 fats, which are found in olives, almonds, avocados and salmon, can help teens focus and decrease risks for cardiovascular problems and strokes later in life. In addition to increased energy and overall better health, a healthy diet also balances teens' blood sugar levels, which in turn affects the mood and how the body functions. Additionally, it helps maintain serotonin levels in the brain, promoting sharp mental processing and an elevated mood. According to a report released by the Trust for America's Health (TFAH) and the Robert Wood Johnson Foundation (RWJF), the percentage of obese or overweight children is at or above 30 percent in 30 states. Additionally, obesity costs U.S. citizens an estimated $100 billion a year. A healthy back-to-school diet for teens is essential not only for overall health, but also to keep stress under control, increase energy and maintain mental processing and health.